On a trip to Stowe we went looking for a place other than our hotel to have some brunch and thanks to some super sleuthing (not on my part) we came across McCarthy’s. At first sight one would think nothing special of it, just another greasy spoon, although when you sit down and take that first bite you will be pleasantly surprised. The menu is of decent size and portions of it are also offered for the lunch sitting. You will find some good options here and the quality of the food is fresh and healthy. I had a French toast made of nut/oat bread ($6.99); it came with a side of sausage, 2 eggs and maple syrup on the side. 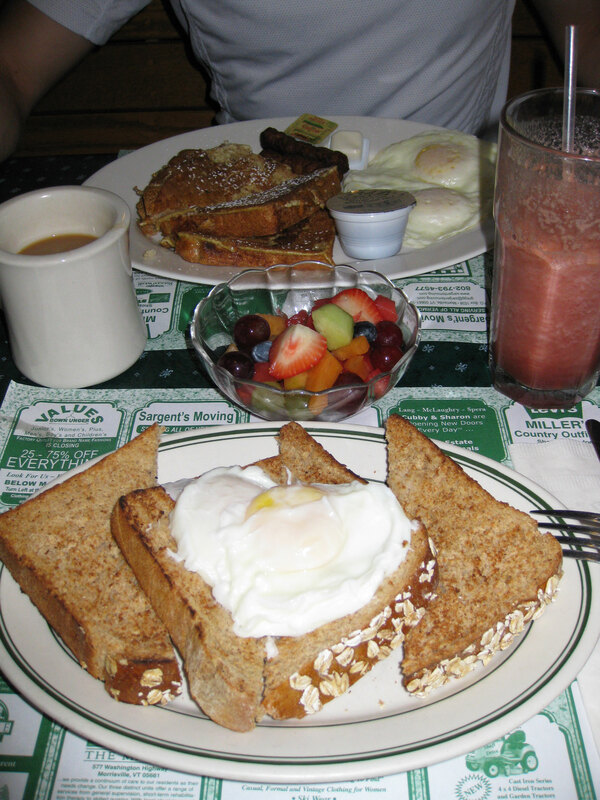 There was also a poached egg and toast ($3.99) with the option of nut/oat bread toast. The special bread they make there was quite tasty and well worth a try, I strongly suggest it. The raspberry peach fruit drink ($3.50) was really really thirst quenching; it was thick, but I have had thicker, and I don’t recall if it passed the straw test, but it’s worth trying. The fruit bowl was ok and costs about $3.00, although it consisted of pretty standard fruit, none of which stood out. One thing to note was that coffee is not included with any of the plates so you have to pay once, but the refills are free. Service was really good; we got tons of refills and our waitress came to check up on us very often. One thing to note is that you have to pay at the cash and they don’t really mention it when you get your bill or on the bill itself. Most of the plates do not come with meat but if they do you can ask them to hold it. If you’re vegan there is apparently a really good oatmeal that they also sell the packaged mix of. 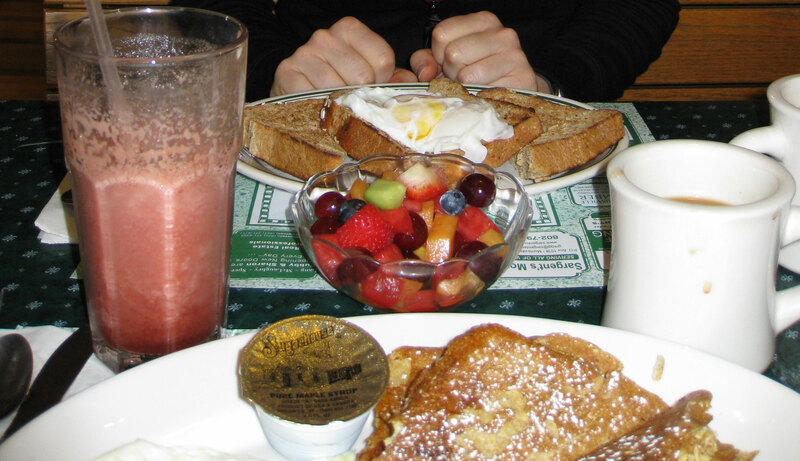 If you’re ever in Stowe and want a good hearty and healthy breakfast, do try McCarthy’s and you will not be disappointed.